A constellation necklace is a sophisticated and subtle twist on personalized jewelry. 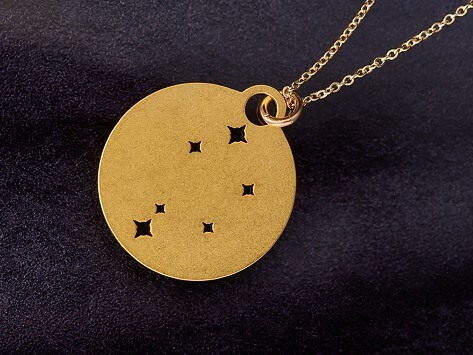 The constellation representing a zodiac sign is laser cut into a gold-plated stainless steel pendant. Each necklace comes ready to give in wooden packaging and each one helps fund conservation efforts through contributions to The Trust For Public Land. Dimensions: 9" x 0.88" x 0.05"
For Christmas and subsequent birthdays, I have bought these pendants—and everyone LOVED them! I will probably buy a few more! Bought as a gift for my son's girlfriend. She loved it! Simple, beautiful, light weight ...bought one for each of my kids...love them. The laser cut jewelry from Outdoor Metalworks has a minimal vibe and is beautifully made with a nature-preserving mission. Maker Nate Barr, who is also the engineer behind Zootility pocket tools, was inspired to create a constellation necklace after experiencing the nighttime view on a hike in New Hampshire. He and his wife want to help protect outdoor places like it, so each necklace sold helps fund the purchase of public lands. The necklaces are made in Portland, Maine and have a clean, simplistic feel. A constellation that represents a zodiac sign is laser cut in gold-plated stainless steel using the same process as Nate’s pocket-sized multi-tools. The result is a sophisticated piece that’s subtly personalized and works for everyday.